If you’re looking at this post you’ve probably been trying to solve the problem of Outlook 2016 suddenly not displaying images in email. This problem was on my daily driver Windows 7 Dell E6530 (I have others). Others have had it on every other Windows OS. You’ve probably tried all kinds of things and are mad at Microsoft. Same here. 1. 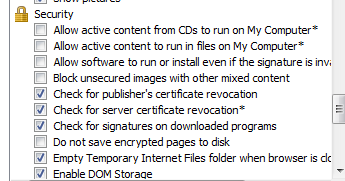 Internet explorer advanced options: Do not save encrypted files to disk. 2. Outlook options in the Trust Center: Don’t download pictures automatically in standard HTML email messages or RSS items. 3. Send Pictures with Document in HKEY_CURRENT_USER\Software\Microsoft\Office\16.0\Outlook\Options\Mail missing from the registry. 4. Removing some Windows updates (should never have to do this, but we all know we’ve done it). However, I found that resetting IE fixed the issue for me. 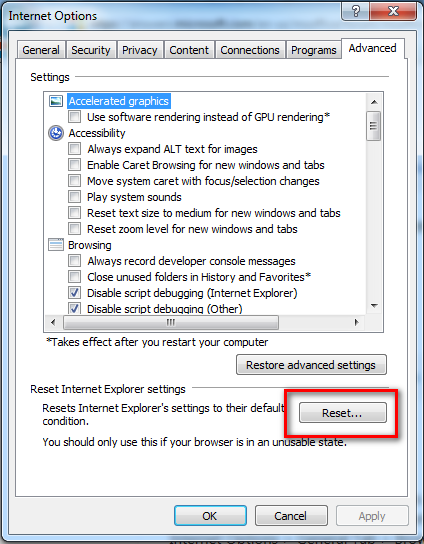 In IE Advanced Settings, click the reset button and reboot. Yeah, sucky solution, but it’s the only one that worked for me. This entry was posted on September 10, 2018 at 6:16 pm	and is filed under Computer Software. You can follow any responses to this entry through the RSS 2.0 feed. You can leave a response, or trackback from your own site.